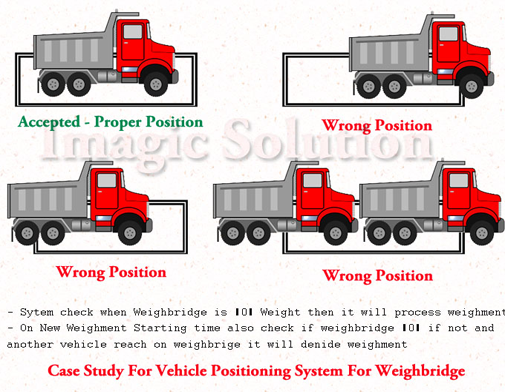 VEHICLE POSITIONING SYSTEM, Weighbridge Software, Weighbridge Photocapturing on weighment time, photo censor based vehicle position system, TAS System for Weighbridge, Truck alignment system for weighbridge. This automation system is use full for vehicle proper position on weighbridge. System integrate with PLC/Controller Based Intelligent terminal, that terminal manage photo/IR censor and find out vehicle position and make further process for weighment. Weighbridge software all the feature included in this software, also we provide custom based software solution in weighing line. Not Require to manage vehicle position, its auto manage by system. System auto control weighbridge traffic. Restrict unauthorized vehicle weight on weighbridge.